Download Tosin Martins – “Oro Oluwa” ft. Kenny Blaq mp3 now. 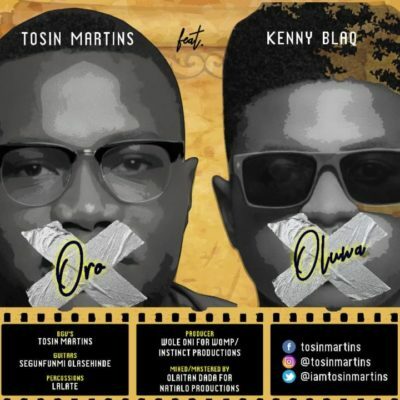 Listen & Download Tosin Martins – “Oro Oluwa” ft. Kenny Blaq as it is hotly served. Against the temptation to wallow in thoughts about unrealised targets, notable artist and minister, Tosin Martins teams up with celebrated comedian and singer Kenny Blaq to deliver a new tune titled “Oro Oluwa”. “Oro Oluwa” is a dance song with a message of hope. It’s a very current and modern approach to traditional Apala music and produced by the talented producer of Tosin’s hit “Olo Mi“, Wole Oni for Instinct Productions. Oro Oluwa promises to be a keeper throughout the new year and beyond. Enjoy!!! NB: Please be aware that Tosin Martins – “Oro Oluwa” ft. Kenny Blaq is hosted outside this particular website as we host NO file. In case of any copyearight claim and request for take down, kindly use our 'contact us' page to put a notice across.